Today is my nephew's First Communion. He is the younger brother of my niece, who only last month had her Confirmation. My sister has been very busy planning these events and will be relieved, I'm sure, when we all go home tonight! lol! I don't often have reason to make a Yo-yo Yellow card, but John Michael loves yellow, so I went bright! I used my Silhouette Portrait to make the cross. I lined up all the circles, then deleted the centre one and replaced it with a heart. I added his initials and today's date to personalize. Can you believe the fine-ness of these cuts? Awesome! I'm sure he'll love this! Spectacular Ar! Looking forward to seeing you today! Oh my goodness! This is a wonderful card! I love the personalisation of the initials and date. And I cannot believe the fine-ness of those cuts, amazing! Such a creative idea! Love this! 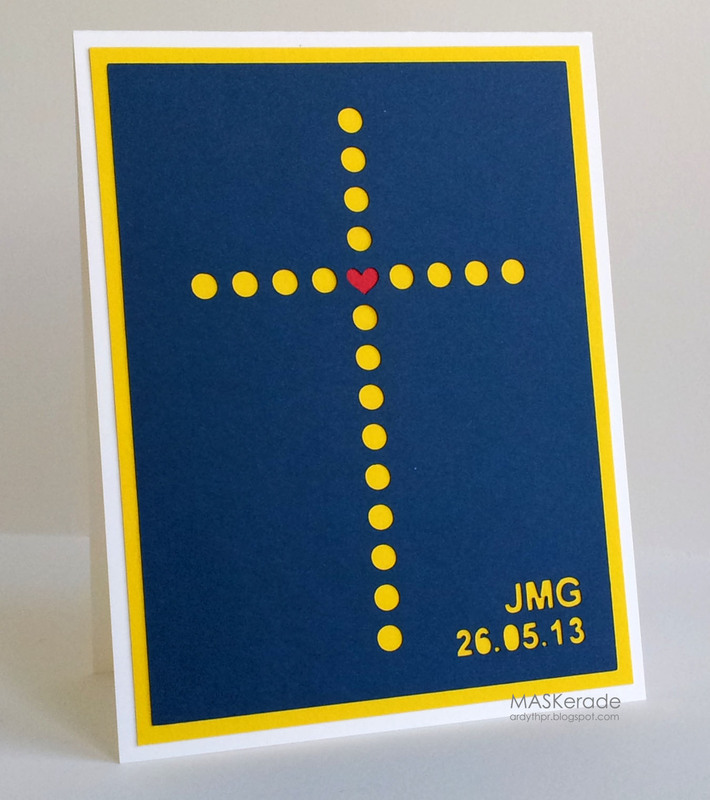 The personalisation in the corner is a great detail and the little heart in the centre is perfect! This will be such a beautiful remembrance. The cuts are great. I wish I had had a better first experience with my Portrait. I need to get back with it and work out the "bugs". Congratulations to your nephew! I love the clever design of your card and how you incorporated his favorite color. What can I saw but WOW! Perfect card! What a great idea for a First Communion card. Lovely, Ardyth, just lovely. Seriously, the coolest Communion/Confirmation card I have ever seen! He is going to love it! I really like the yellow! Cool idea to put his initials and the date - perfect keepsake! So lovin' what that Silhouette can do. This is the first time since I turned 50, that I can hardly wait for my b-day to arrive! So cool! At first I thought you had punched/die cut all of that. That would have sent you into the Goddess of Crafting stratosphere! LOL!